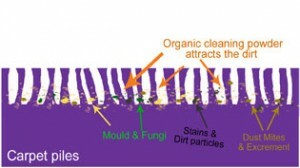 De Hygienique use world’s leading revolutionary dry carpet cleaning technology manufactured in Europe. 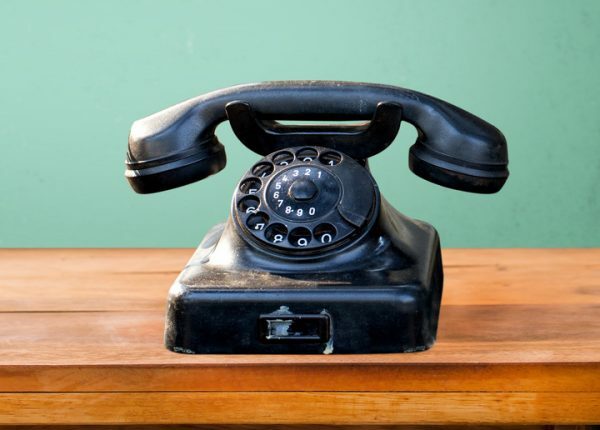 Our professional carpet cleaning are equipped with cleaning technologies and a range of effective and safe stain removers, which may not be available in the DIY chemical shops, to tackle stubborn stains by using minimal fluid that does not contain any harmful chemical. The revolutionary dry cleaning technology is able to deep clean the carpet safely and remove stubborn stains effectively. 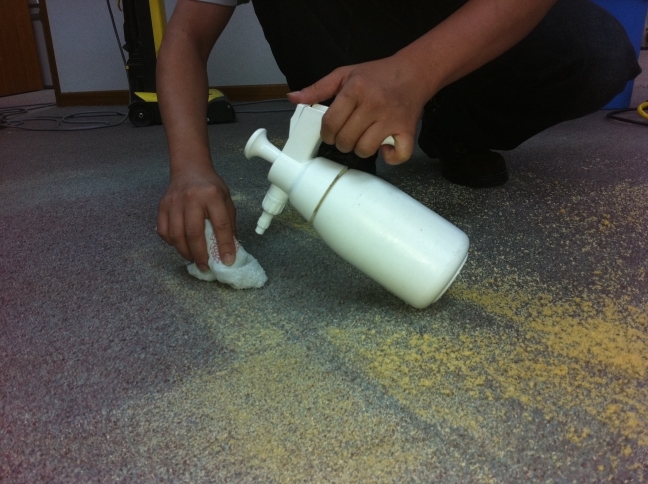 This system uses natural compound that works like micro sponges to absorb dirt within the carpet. Armored with a range of stain removal agents for different types of stains, this carpet cleaning system is able to clean and sanitise thoroughly – without ANY down time! Remove dirt from deep inside the carpet piles. Refresh the colour of the dull-looking carpet/rug. Restores the ‘fluffiness’ and softness of the flat carpet hair/pile. Remove different type of spots and stains effectively. Note: Result depends on the nature of stains. Leaves no water stains and chemical residues. Not only clean but also sanitise! 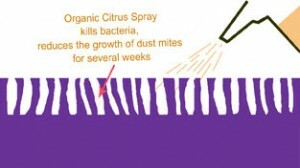 Delays re-infestation of dust mites. The two counter-rotating brushes will loosen the dirt, clean from bottom-up, and restore the carpet pile. Fresh natural cleaning compound made of pine wood is applied and brushed into the carpet to aborb stains and dirt in the carpet. The soiled compound from the carpet are brushed into a patented tray. 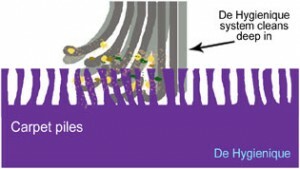 Finally, the application of the internationally patented Potema® Sanitising Spray would protect the carpet against bacteria and viruses and delay the re-infestation of dust mites and allergens. It is very important to get your carpet thoroughly cleaned by professionals in between those daily vacuuming so as to freshen up the carpet and its colour, lift up the flattened pile and eradicate those harmful indoor pollutants that can potentially trigger respiratory problem and other allergy ailments. 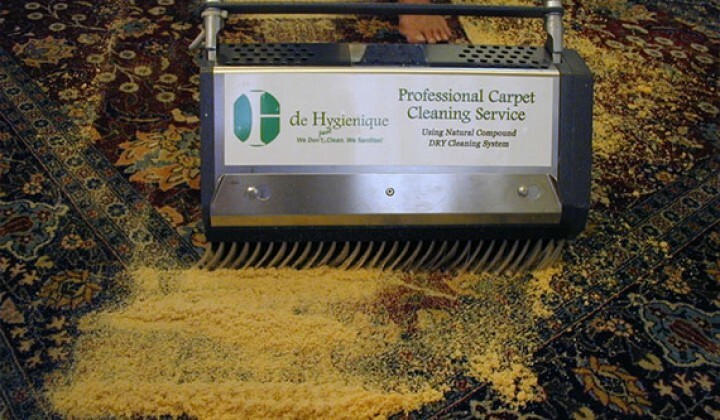 For optimal carpet maintenance and ensuring good indoor air quality in your home/workplace, De Hygienique recommends your carpet to be professionally deep cleaned at least every 12 months, depend on how heavy is the traffic movement on the carpet.